Home Off Beat	The Ice Guitar, cool mania for heated music! The Ice Guitar, cool mania for heated music! The Spanish can just about do anything with guitars. Not just that they play them serenely they even think beyond the domains of the acoustic or wooden or the electric ones. 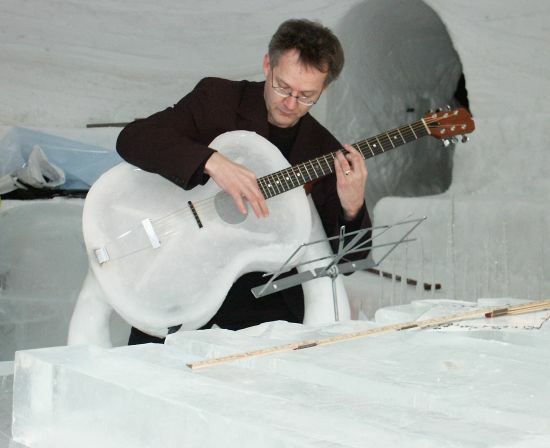 In the picture above you see Professor Jan-Olof Eriksson who has taken his fanaticism to a new level by designing a Guitar from Ice Hats off to his creativity but then the professor mustnât go beyond an ice chamber to play this one for then his music would melt, what say people!